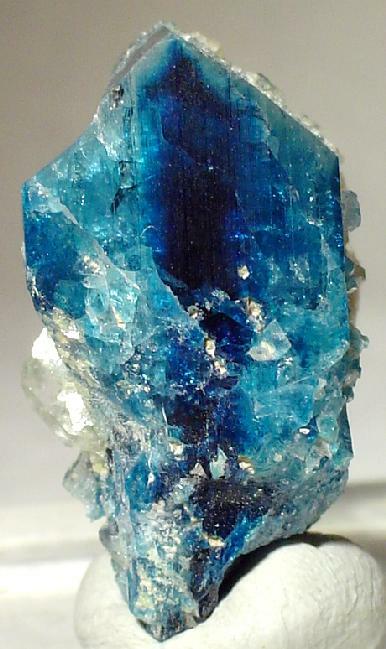 Euclase is a beryllium aluminium hydroxide silicate mineral. ​It crystallizes in the monoclinic crystal system and is typically massive to fibrous as well as in slender prismatic crystals. It is related to beryl and other beryllium minerals. 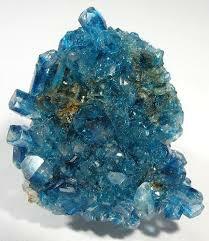 It is a product of the decomposition of beryl in pegmatites such as quartz, feldspar or mica. 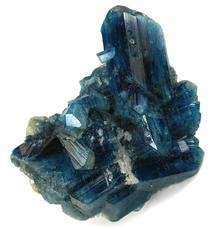 Euclase is found in granitic pegmatites with other gem minerals such as topaz and beryl. 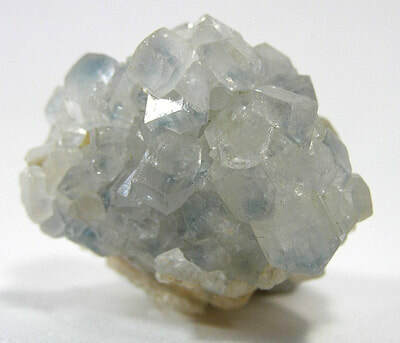 It is easily identified by its crystal form which can only be confused with barite or celestite but is the wrong environment for these sulfate minerals. Euclase gets its name from its easy cleavage, euclase simply means easily cleaved. The energy of Euclase helps to transform negative thought patterns into positive ones, it assists in clearing and healing your energy fields and your environment. This stone aligns your physical and emotional energy fields to your soul. ​Euclase connects to the heart, throat and third eye chakras. It allows you to understand and "see" the truth in all situations, to act with heart-centred awareness and communicate and speak your truth with clarity and honesty. Notable Occurrences include Brazil; Kenya; Tanzania; Russia; Germany and Columbia. 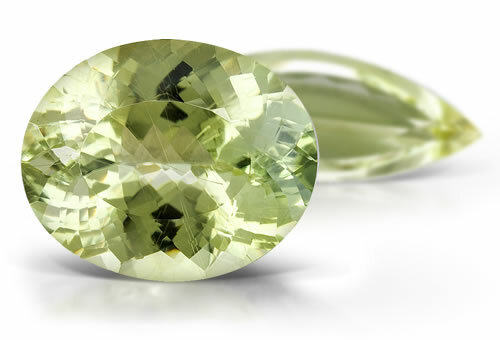 Euclase is not a well known gemstone, but is more well known by mineral collectors. It forms well formed crystals that occasionally have enough clarity to be cut as gems. The sapphire blue and blue green colors of euclase are the typical colours of the crystals but they also occur as colourless, yellow and light green. Finally there are very rarely, incidents of purple euclase. Euclase has a vitreous lustre and are transparent to translucent. 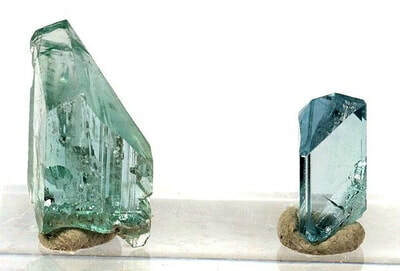 The stones occur as stubby prismatic crystals with non-symmetrical slanted terminations. Euclase facilitates the eradication and control of the pain from arthritis, muscle cramps and muscle tension within the body. If you have cuts, scratches or bruises, an euclase crystal placed on the wound will heal and reduce the pain and swelling due to its antibacterial effect. This stone assists with inflammation and swelling of the organs in the body and encourages healing. Euclase has been known to reduce the constriction of blood vessels and hardening of the arteries. For those who have headaches that come from sinus problems then this stone will be able to help you, place the crystal over the sinuses or use the crystal water as a nasal spray. If you have difficulties swallowing then then taking crystal water will ease the problem. Euclase is an all round antispasmodic, antibacterial and antiseptic. Euclase helps improve eyesight and vision. It enhances brain function and can assist in faster and more accurate learning and mental processing. It is an excellent stone for overcoming stuttering and other speech disorders. Euclase assists you in seeing when it is time to be forgiving of yourself and others and become aware that no-one is perfect and we all make mistakes in life. This stone enhances your ability to see and understand your mistakes and it will help you in correcting them in the future. Euclase give you a "gut feeling", the knowledge of when someone or something is not real and honest. Euclase is a stone of compassion it will open your heart and mind to the feelings of others. This stone will help you in communicating your needs and desires in a non confrontational manner. Euclase is a stone of inner clarity and self expression. This stone will give you the wisdom to know when it is time to move forward in you life. If you have a current project or writers block, euclase will assist you in unblocking your creative energies. It enhances integrity and pride in yourself and your achievements. This stone enhances your ability to understand when it is time to use your intuition as a guide. Euclase puts an emphasis on straightforwardness and clarity, when you experience these moments, enjoy them and to pay close attention. Euclase is helpful in clearing negative energy and eases confusion and feelings of being overwhelmed. 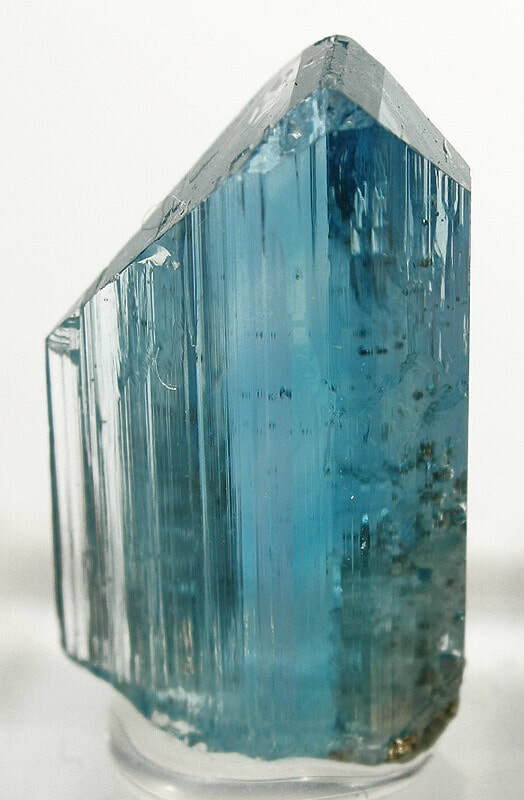 Euclase assists you in accessing the Akashic records so that you may understand your previous lifetimes and show you how this knowledge can be used in this lifetime to forgive yourself and to move forward on your soul's path. Euclase aids in understanding karmic patterns, transforming dense energies, and clearing and aligning energy fields with soul-level energy. This stone can stimulate the psychic senses.